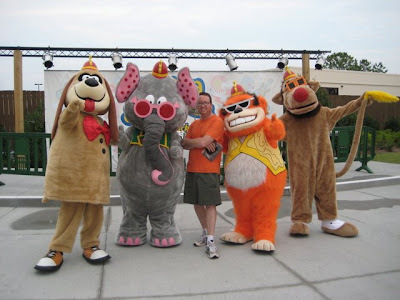 It takes a crack investigative reporter to get to the bottom of whatever happened to the Banana Splits! I think Fleegle has lost weight. Funny, John - I almost lost it at "Somewhere Tim Berners-Lee is weeping". The weird thing is Plant and Page were allegedly consulted on their ride, so they are presumably weeping in a bank-oriented ambulatory action. @SC: The story just fell in my lap. I was walking through the park and saw the Furry Four. Their "performance" had been canceled by a thunderstorm but their "manager" (picture a younger, goateed Ruben Kincaid) was kind enough to chat with me. @Peromyscus: It's actually a great ride. It doesn't have the clanking, wrenching quality that so many older roller coasters have (and which some devotees love). Rather, it's very smooth, but fast and furious. I'm not up on Zep's cosmology (I'm a relatively late convert) but there's nothing for them to be ashamed of. And there are worse things to hear as you're hurtling through space than "Whole Lotta Love." that pic with the bearskin babes has just derailed any future Presidential bid. Glorious, really glorious. John, I always suspected that Witchypoo was the cause of that breakup. So what's the blog gonna be called? I bet the real people behind those Banana Split customs are: 1) Your Lovely Wife, 2) Sarmila, 3) Yao and 4) Bill Clinton. Well, at last you appear again. I was getting worried. No gargoyles at MB,I guess. Miss 'em. JK I bet you're glad you had your time in good old Blighty so that you could immediately identify the cultural resonances of the bear-skinned beauties? BTW - I'm with markfromalex - wot about the blog? We went back in June, a couple of months after it opened. My thirteen year old son does not like roller coasters. However, as a huge Zeppelin fan, he worked up his courage and loved it (after he got through the first drop). Loved seeing his expression on the DVD of total "I'm about to die" to exhiliration! The timing of Whole Lotta Love and the drops/loops was perfect. Everytime I hear that song, I'm going to think of that drop! Did you go on the Maximum RPM mini-car ride and stand in the "karaoke queue" with one of the Spice Girls? The ride had just opened two days before we arrived, so they were still working out the kinks. We stood in line for an hour & a half, for a 30-second ride (that almost got stuck at the top). Missed the Banana Splits, but had our photo taken in front of the Abbey Road mural. All in all, a good time. You can only go to Broadway at the Beach so many times. Glad they had something new this time. Looking forward to your column/blog in the Post. I just read - on the BBC, so it must be true - that the Banana Splits are indeed making a comeback. This I learned from the BBC online article "The Banana Splits to make Comeback". Never, ever again will I doubt anything John says. Ever....about ANYTHING. Interesting post. I have been wondering about this issue,so thanks for posting. I’ll likely be coming back to your blog. Keep up great writing. Find your great Travel News and sing the songs at Free Song Lyric or you can watch the drama at Korea Drama Online one of great korea drama is A Love to Kill if you go to travel to Indonesia learn Learn Indonesia Language first! And find your home cari rumah or make a blog Belajar membuat Blog find your home again rumah dijual and again at jual rumah, download youtube and find blog widget and then if you want buy a new laptop see the Laptop Price List or you can buy a New Blackberry and then take care your Health & Jewerly.